Many of the most serious accidents on our highways are caused by trucks, 18 wheelers, big rigs, and large commercial vehicles. When was the last time you saw a UPS or FedEx truck zipping in and out of traffic to make up time? When was the last time you saw a dangerous driver operating an 18 wheeler, who probably exceeded a reasonable number of hours in the day, to complete his haul, speeding, weaving aggressively, driving in the left lane, pushing through traffic, which makes you think, “with the slightest mistake, I could be seriously injured or die because of somebody else’s carelessness or recklessness.” The reason for the seriousness of these truck accidents is clear; the size, velocity and forces generated by such a large vehicle are difficult to control, and once a truck loses control of his vehicle, those massive forces are transferred into the objects it strikes, YOU, your car and your body. All too often, truck drivers violate federal law by driving over the hours they are permitted to drive, and tired, under pressure to meet deadlines, and resort to the use of drugs and other substances to allow them to complete their runs and deliver the goods they are carrying on time. The Federal Motor Carrier Safety Administration (FMCSA) regulates truck drivers and their employers. If an employer allows the driver to violate these rules and regulations, they can be liable to you for the driver’s negligence by vicarious liability or by negligently supervising and/or hiring the wrong doer driver. Trucks now carry “black boxes” (Event Data Recorders- EDR’s) that can tell the true story of your accident. These devices record data of all events that occur up to and during your accident- the truck speed, movement (time between stops), maintenance, internal operation, braking, and other critical information, which allows us to reconstruct your accident and provide critical evidence of the cause of your accident. Big trucking companies automatically retrieve this information and save it, but rarely provide this information to you. Time is of the essence to preserve and obtain this data. We have experience in establishing a duty in the trucking company to maintain this evidence once requested, but in penalizing the trucking company for failing to preserve this valuable evidence which leads to potentially harming your case for their failure to act. 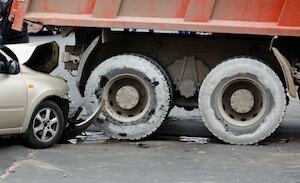 You should only hire an experienced Miami truck accident lawyer to handle your claim. We have over 34 years of experience representing victims of automobile and truck accidents, and victims of serious injuries, including those suffering wrongful death, traumatic brain injuries, serious spinal injuries requiring back surgery and multilevel fusions, fractured femurs, fractured tibia in the knee and ankle replacements and fractures. Our experienced team will give you the personal attention you and your loved ones deserve.